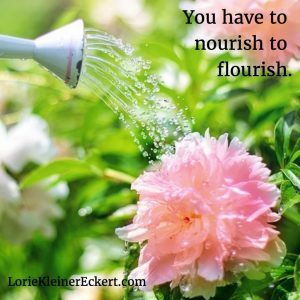 Have you been in Lorie’s audience? Have you read her slice of life column? In most of these situations, it’s ironic to realize that what we thought was a realized goal – the degree, the move, the marriage – is instead ground zero for what comes next. And what does come next? Figuring that out is tough. The opening song from the musical Avenue Q expresses the situation perfectly. In it, a young male character boasts of his new B.A. in English even as he wonders aloud, “What do you do with a B.A. in English?” Please notice here, that even with a positive life change like a newly minted college degree, the way to move forward is still perplexing, even worrisome. In my latest experience with reinvention, I needed to find myself after the death of my significant other, Big Irv, who died after a four-year battle with lung cancer, an abdominal aortic aneurism, and a brain tumor. It was a stunning loss. We all acknowledge that there is such a thing as chemo brain, we also need to recognize the existence of caregiver’s brain. I felt sapped and zapped. I had been worrying about him for so long that I didn’t know what else to think about. I will confess to some months of malaise following his death, though I forced myself to do healthy things like get dressed daily. I also managed to continue going to the caregivers’ support group that I had found during Big Irv’s illness. And then a friend suggested that I write about the experience in a journal, which I did. In the middle of all of this I managed to find a new hobby – a HUGE interest in the films of British actor Bill Nighy (best known for his role as Billy Mack in Love Actually) – which turned me into a couch potato and thus gave me extra rest. As mundane as all of this sounds, it is actually my recipe for reinvention. Though it is not rocket science, it does work: You need to stay busy in a meaningful way and let time pass. In my method of staying busy, you are actually taking one step at a time in the direction of your new life. As it turns out for me, all that writing and film watching turned into a book that is part memoir, part unauthorized biography of the actor, part flight of fancy, and lots of fun. It is called Love, Loss, and Moving On. As in all of my writing, as I tell this story of my life, I hope others can glean life lessons. Though my book shows you how I reinvented myself, in this blog I will tell you how to do it. Get dressed daily. Ladies, that includes doing your makeup and hair. Go someplace every day. Being a shut-in is a BIG no-no. Stay in touch with family and friends – email, text, call, or see someone daily. Eat nutritious meals and snacks – you have to nourish to flourish. Practice good sleep habits. Have a set time to go to bed and a set time to wake up. A daily nap is fine, but two might signify depression. Visit a doctor if you need to. If prescription drugs are called for, there is no crime or sin in accepting such help. I have written about the importance of having a routine in the past. Specifically, I told the tale of my father in retirement who had a different activity scheduled daily. If it was Monday, he mentored at an elementary school; if it was Tuesday, he volunteered at his temple, and so forth. When my mom died after a five-week illness, Dad didn’t know what to do with himself, except of course, he did. If it was Monday, he mentored at the elementary school; if it was Tuesday he volunteered at Temple, and so forth. In this manner, his ho-hum and boring routine became a life saver. Part Two: This part will be slightly different depending on your reason for reinvention. There are sad/forced reinventions like the ones that take place after you were fired, your boyfriend broke up with you, or you suffered an illness or injury. The happier/chosen reinventions occur when you are in the driver’s seat wanting to start a new business, become healthier, find a new relationship, or the like. In either case the plan is this – take one step a day in the direction of your goal. If you are going through one of those sadder reinventions, your goal may be just to feel better. For happier reinventions, dozens of steps may be necessary to attain your new business, body, or buddy. All are terrific goals. All can be accomplished one step at a time. But here’s the deal, all require that you get started. 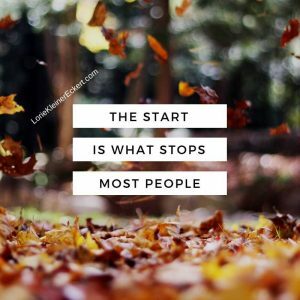 If you start now you’ll begin seeing results one day earlier than if you start tomorrow. Note: I post motivational messages six days a week on Facebook, LinkedIn, Twitter, Instagram, and Pinterest. All of the illustrations in this blog are borrowed from those posts. Please follow my work on your favorite social media platforms! Nice! Good “tions”: explanations, suggestions and directions! Very helpful for anyone. Hi Stefan, Thanks for positive feedback!! Thank goodness it’s a long time off until your nest is empty and you are into reinvention!!! I love the part about the routine. Yes, I know what to do – bridge on Mon & Wed and the movies with Lorie on Thursdays! So happy to be a part of your Thursday routine!! 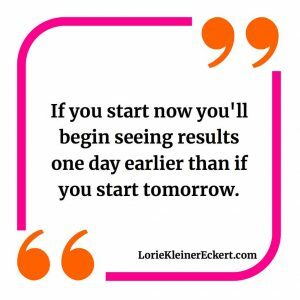 Great reminders, as always, Lorie. Reading your blog is like sitting down with you over breakfast, or lunch, or coffee, or whatever. Thanks, friend! I look forward to sitting down over brunch with you soon! Evaluating Yourself – Earning All A’s in Life! Click here for the Newsletter Archive. © 2019 Lorie Kleiner Eckert.